Bettertex Interiors has the experience and capability to reupholster any furniture including chairs, couches, ottomans, cushions, and basically anything made with fabric. Our experienced craftsmen can get you the look and quality you expect for your high quality furniture. 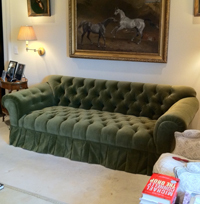 Re-upholstery involves the process of making your furniture look better than new! The first step of reupholstery is to remove the existing fabric and basically strip the furniture to the bone. We then replace, repair, and tighten the existing springs and webbing to make sure they are in top condition. Then we apply the new foam, feather, or horse hair padding (if applicable) to the unique chair. Then comes the super fun part in re-upholstery: applying the new fabric on the frame! Your dream chair will become a reality. 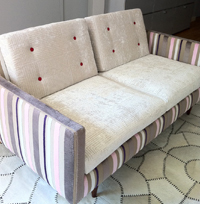 We also offer any changes on the reupholstery that you would like done to the existing frame like: add or remove buttons, add or remove a skirt, make the sofa shorter, etc. we also offer re-finishing service on any exposed wood on the furniture. Custom Reupholstery: Our custom reupholstery services are able to reupholster any of your furniture or accessories. Have you already picked out the fabric you want on your furniture? We have no problem using your fabric. Otherwise, we have a large selection of thousands of fabrics you can choose from. This includes 20,000 of designer fabric brands in stock at closeout prices and endless sample books of designer fabrics to choose from. Luxurious Fabrics: We are proud to offer thousands of unique and luxurious fabrics from amazing brands such as Kravet, Duralee, Lee Jofa, Shumacher, Robert Allen, Beacon Hill, Highland Court, Fabricut, Stark Fabric, Trend, Zoffany and more. Choose on your own or let one of our experienced specialists help you choose what would work best for your furniture. For any quote please fill out our Free Estimate Request Form or contact us directly at 212.431.3373, we would love to work with you.